When we put the finishing touches on our latest game, Talking Tom Gold Run, we knew it was an app that mobile gamers would love. We just needed a way to let them know that, too. Our solution: cross-promotion. After years of developing highly rated apps, we have an existing user base that’s already familiar with our products. We use a machine-learning algorithm (MLA) to optimize and deliver ads highlighting our latest offering to our existing customers—and watch the downloads surge. Cross-promotion is a powerful tool for any app developer’s arsenal. Here’s how we’ve perfected it over the years, and how you can borrow our techniques for your apps, too. When launching a new app, it’s important to maximize the install rate. A surge of installs on the first day will boost the app’s ranking in app stores much more than the same number of installs spread out over a week. And the higher an app is ranked, the more visibility it will have even to people who weren’t looking for it at first, driving organic installs in turn. Along with paid user acquisition (PUA), cross-promotion is one of the best ways to climb the ranking quick. In the graph below, you can see that for Talking Tom Gold Run, more than 50% of all installs on the first day after launch were cross-promotion installs. 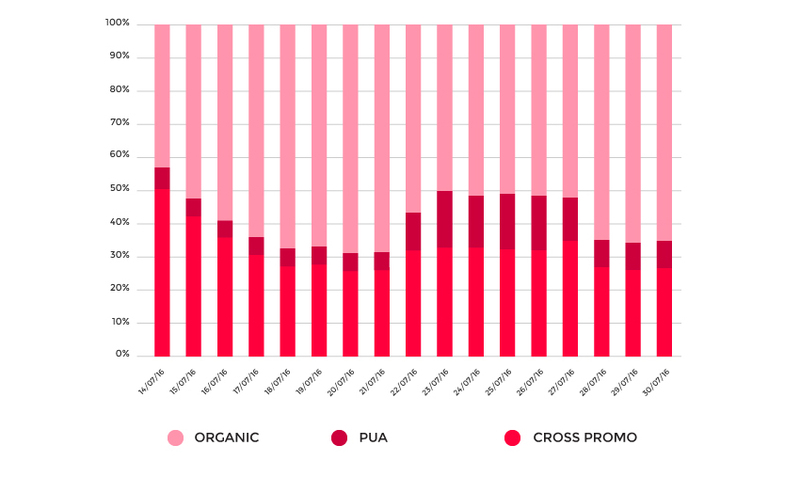 After that, the proportion of cross-promotion installs declines quickly as organic install rates increase. By the end of the first week, nearly 70% of all installs are organic. Whenever we launch a new game, our existing users are the first to know about it. When they open another game we’ve created, they’re introduced to our latest offering as well. In the case of Talking Tom Gold Run, the majority of cross-promotion installs came from three existing games: My Talking Tom, My Talking Angela, and Talking Tom Cat 2. To verify that our users are receiving valuable content and not spam, we use in-house developed algorithms to ensure these ads are uniquely relevant to mobile gamers. When we conduct this kind of testing, our key performance indicator (KPI) is our impression to conversion ratio. In other words, we want to number of people who saw the ad and the number of people who then downloaded the app to be as close together as possible. If an ad is getting seen a lot of the time but not leading to a lot of conversions, that’s when we retire it. 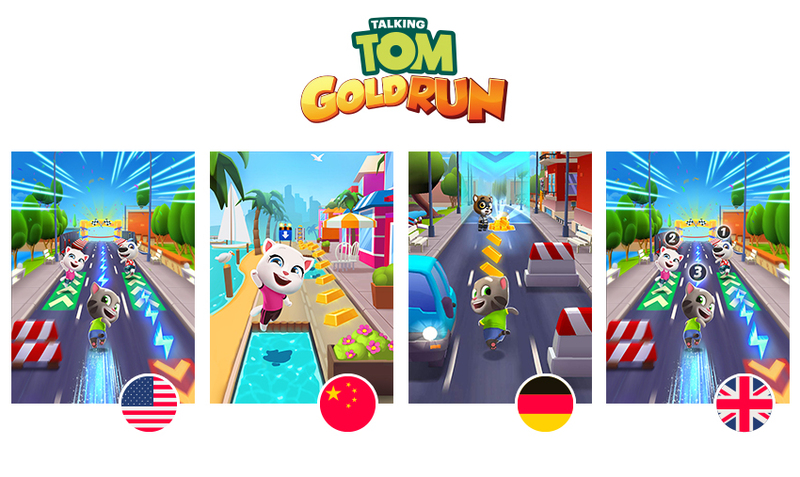 With our latest offering, Talking Tom Gold Run, we began cross-promoting before the game was even out. We are always experimenting with different ways to notify users about our games—the faster, the better. As our game library has expanded, cross-promotion has created a spillover effect—the more games we have installed, the more cross-promotion channels we have, and the more likely mobile gamers are to become repeat customers of multiple apps. However, we’ve found that this type of promotion is most effective when we put an emphasis on the variety of our ads—utilizing videos, display graphics, text, and dozens of versions of each medium. It’s not only that customers get tired of seeing the same ad too many times. The other reason variety is important is because we have an international audience, and customers in different regions react differently to different kinds of cross-promotion. For example, take a look at our top-performing static image ads in four countries. China, in particular, illustrates the way we adapt to different app stores in different regions in order to see cross-promotion succeed. Talking Tom Gold Run is in 56 different app stores in China, each of which has its own requirements for us to meet. But that hard work has paid off. Today, we’re the biggest Western mobile game company in China. Talking Tom Gold Run was the 11th most downloaded free iOS mobile game in China this past year, and the only Western game to crack the top 15. Finally, we are never finished perfecting our technique. Our mobile gamers’ experiences are our top priority, so we constantly experiment with when and how often we show cross-promotional ads. Currently, we have 12 unique cross-promotional mechanisms across our apps, taking forms from banner ads to news reports to special offers for customers. The medium really does matter: right now, just three ad types are bringing in 85% of cross-promotion app installs, indicating that some are clearly more popular than others. We look at advertising the same way we look at creating innovative gameplay—it should never be dull! Cross-promotion is only one of several promotional strategies we use, but it is one of the best ways to climb app stores’ rankings fast and create high install rates at an app’s launch. 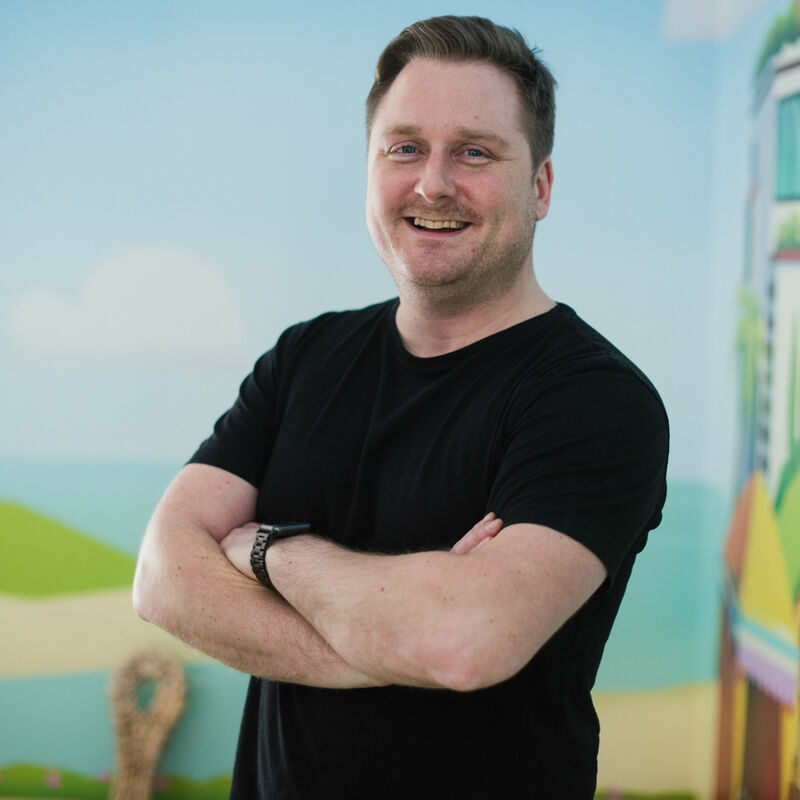 We’ve been successful at it because we put our users’ needs first, using rigorous testing to optimize ads for different audiences and ensure a good user experience. In fact, many of our loyal users see cross-promotions as a reward, because they are the first to know about new games and updates—a far cry from the usual negative reaction most mobile gamers have to ads.